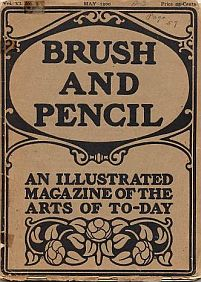 Brush and Pencil was the official journal of the Brush and Pencil Club in Chicago. It was a well-illustrated review of contemporary American painting and sculpture, with occasional articles on the decorative and applied arts and work by foreign artists. It also contained a monthly round-up of art news, together with book reviews and exhibition reports. The first editor of Brush and Pencil was Charles Francis Browne (1859-1920), an instructor at the Art Institute of Chicago and one of the founders of the Club.He was succeeded by Frederick William Morton (1859-1935) who remained its editor until the closure of the magazine in June 1907.